Heat the oven to 400°F. Make a pattern by cutting a piece of paper into a heart shape, 7-inches long x 7 1/2-inches wide. Unfold the pastry sheet on lightly floured surface. Roll the pastry sheet into a 14- x 10-inch rectangle. Use the pattern to cut out 2 hearts in the pastry sheet. Cut the remaining pastry into small hearts, using a small cookie cutter. Place the pastry hearts onto a baking sheet and sprinkle them with 2 tablespoons sugar. Bake the pastry hearts for 15 minutes or until they're golden brown. Remove the pastry hearts from the baking sheet and cool on a wire rack for 10 minutes. Using an electric mixer set on high speed, beat the cream, confectioners' sugar, cocoa and liqueur in a medium bowl until soft peaks form. 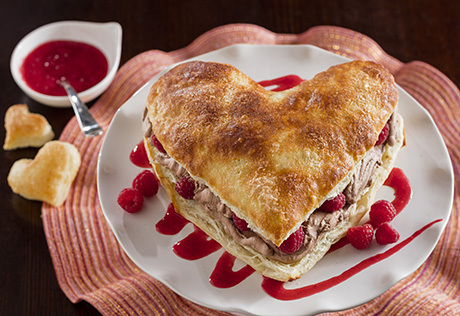 Spread the chocolate mixture on 1 large pastry heart to within 1/2-inch of the edge. Arrange 1/3 cup of the raspberries on the chocolate mixture. Top with the remaining large pastry heart, sugar-side up. Place the tart on a serving plate. Place the remaining raspberries and remaining sugar in a blender. Cover and blend until the mixture is smooth. Spoon the sauce around the edge of the tart and garnish with the small pastry hearts. Recipe Note: For a decorative touch: Before baking the pastry, make criss-cross marks on 1 large heart, forming 1/2-inch diamonds with the tip of a small sharp knife (see photo). The small hearts can also be “criss-crossed," if desired.